The opposition coalition Solidarity has submitted a request for a major march against the authorities’ anti-crisis measures on March 1. Moscow City Hall is yet to grant approval for the rally. The news about the application was reported by one of Solidarity’s key activists, Sergey Davidis. He told Interfax the event would be named simply ‘Spring’ and the maximum turnout is estimated at 100,000. The main objective of the march is to express discontent with the anti-crisis program of the authorities, Davidis elaborated. The head of Moscow’s directorate for regional security, Aleksey Mayorov, told reporters on Monday that various political movements had submitted six different applications for mass rallies on March 1 and added that it was early to talk about any particular plans. According to Russian law, civil servants have three days to officially permit or ban the rally. 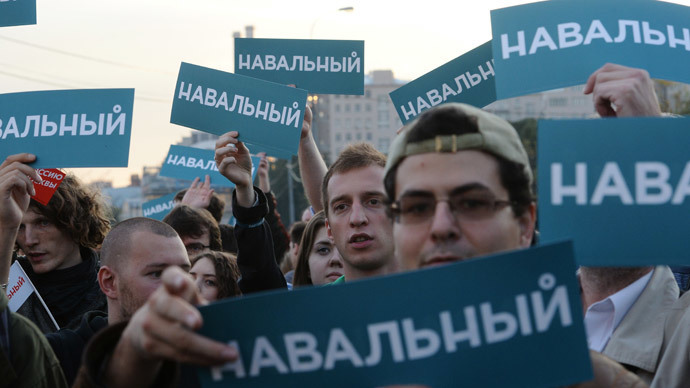 On Sunday one of the main figures behind the planned rally – the leader of the Party of Progress Aleksey Navalny – was detained for promoting the march. Navalny and another anti-corruption activist – Aleksey Lyaskin - were apprehended on Sunday evening in the Moscow Metro and released at about midnight after spending six hours in a police station, TASS reported quoting the Moscow press service of the Interior Ministry. Police said that the detained were violating public order. Lyaskin tweeted that law enforcers registered them both and asked to appear in the station on the next day in order to complete all forms. Navalny also posted a tweet about the accident, calling it “ridiculous and illegal” and adding a photo of himself at a Metro station with uniformed officers in the background. In addition to allegedly breaching the public order Navalny violated the conditions of the house arrest he currently must remain under. In late December, Aleksey Navalny and his brother Oleg were convicted of large-scale embezzlement and received sentences – suspended for Aleksey and incarcerated for Oleg, who was a key suspect in the case. However, the sentence has not yet come into full force which means that the prevention measure for Aleksey cannot be changed and he should remain under house arrest. Navalny has protested about this situation by walking out of his apartment and cutting off the special surveillance device. Each time he was detained and returned home without any additional remands.